We hear from prospects all the time the trials and tribulations that staffing business go through when it comes to time entry. From double and even triple time entry processes to manually entering thousands of timesheets into an outdated system. We cringe at the fact that businesses are using these processes when the future of staffing software is already here. 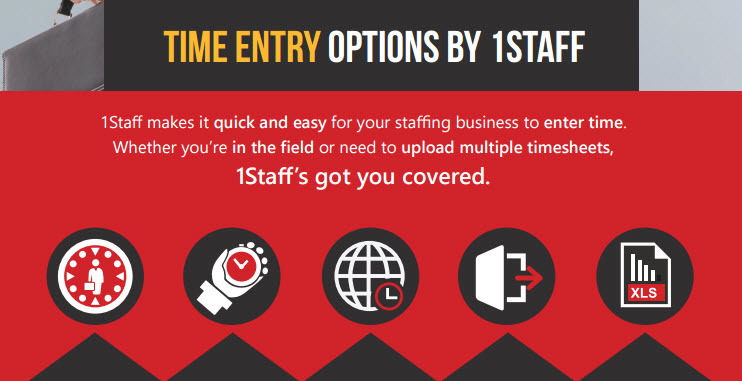 1Staff staffing software is a full front-to-back office staffing solution, or our front or back office can be integrated with your current solution if you aren’t looking to fully transfer over to a new system. As a Gold Certified Microsoft Partner, 1Staff by Professional Advantage is powered by Microsoft Dynamics CRM and Microsoft Dynamics GP. 1. Webtime – Time entry is made easy. Time and expenses including supporting documents (i.e. receipts) are entered through a mobile device or web browser. Approvals can be from a mobile client, web browser, or via email. 2. Time Entry Express – Manual entry made easier. Enter time from an electronic image of a signed timesheet so that timesheet can be attached to the invoice for customers requiring that level of supporting documentation. 3. Electronic File Import – Connecting your VMS and Back Office. Time from external systems such as Vendor Management Systems (VMS) or time clocks can be imported. 4. Excel Import – Use Excel to track time. 1Staff can generate an Excel file with a defined set of contractors for time entry. This is often used for a customer to enter time into the restricted spreadsheet or for an internal employee to enter time for an office. 5. 1Staff Back Office – Enter time on the go. Time is entered manually by an internal employee in Dynamics. This is usually done for exceptions or for adjusting invoices. with online approvals, to faxed timesheets, or VMS timesheets and time clock systems. Harnessing all the power of Microsoft Dynamics® GP, 1Staff provides world class tools at your fingertips to provide efficient, robust financial control. 1Staff can process large volumes of transactions quickly and provides total flexibility over pay types by job, multiple units of time, and entry by piece/unit. Employees can also attach receipts.